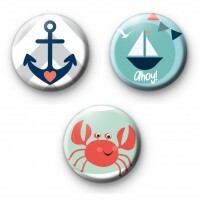 Fun bright set of 3 seaside themed nautical badges. You get a cheeky red crab badge, a blue and grey anchor and a sailboat with the ahoy written underneath. Perfect for birthday parties and keepsakes. All our badges are 1 inch.